Right now I am in the process of divorcing my husband of less than three years. I know, suddenly and harshly, what that feels like. I did not know what that feels like three months ago, just as three years ago I did not know how watching your sister die feels. Abandonment and betrayal, disappointment and sadness — they make a potent cocktail, one many choose to drink in private. I’ve struggled with whether and how to talk about this, how to find ways that were honest and sincere (there’s that word again) without seeming bitter or vindictive. But pain, I think, is lessened when spoken. Vicious truths are less so in the light of day. We talk so we are not talked over, so our stories are not stolen from us by untruths and omissions. This is true: I hurt, deeply. I am wounded in real ways. Things I thought were true were not true. Someone I trusted lied to me with words and with actions. My heart was ripped open. This is also true: I am wiser than I was. And this: I would rather be not-hurt than wiser. It’s the rathers that become so insidious! I would rather have my sister not be dying than have gained the life experience of this journey so far. I would rather have a happy marriage with a husband who wants to be with me than this “teaching moment” of learning who I am again, and how to trust again, and how to find honest truths when I am handed deception. I would rather be happy than heavy with the world. But the rathers are not true. The hurt is true. The wisdom gained is true, even if it slices through us and makes us bleed. It is not glamorous to talk about broken hearts and broken spirits. No one wants to be the person who was replaced, the person who didn’t know, the person who feels a bit naive. To admit hurt is to admit we cared. So we hide, to whimper alone and lick our wounds, while the world keeps on spinning and the most anyone hears from us is the silence left by our absence. Let me say this another way: I was replaced. I did not know the truth of the life I was living. I feel naive and sort of silly for caring more than the person I cared about did. I have let my silence speak for me because I didn’t know what to say or how to say it. But the Live Sincerely Project has taught me that there is strength in taking the private sorrows of our hearts to the mountaintop. It is BRAVE. It is an ADVENTURE. To respond to heartbreak with sheer determination that you will grow and you will heal and you will make it to the other side whole — that is no less of an expedition than Hillary and Norgay reaching the summit of Everest and then making it back down again. There is no shame in heartbreak. It proves that we are not heartless. Here’s a secret: everyone is making everything up as they go. No one knows the future, but every day we learn another way the future will NOT go. I will not grow old with Vanessa. I will not grow old with the person I married when I was twenty-six. What we do know is our present: where we are, and how we got here. I am twenty-nine years old. I was married once. 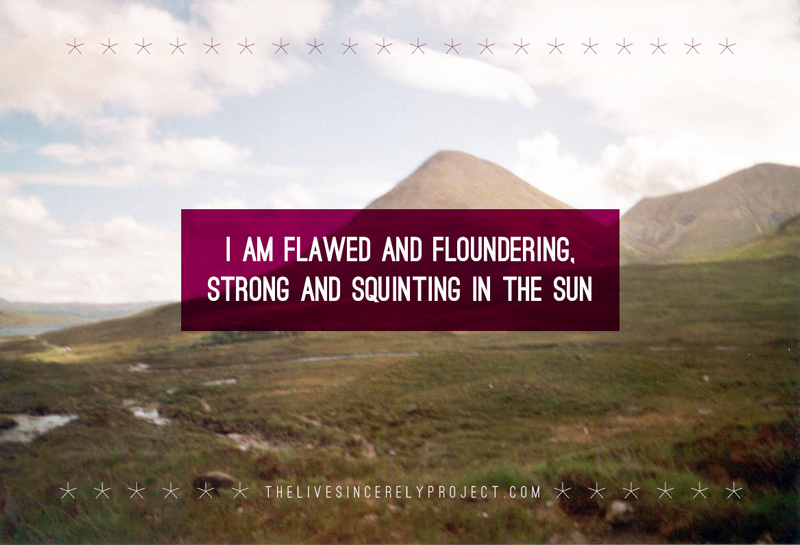 I am flawed and floundering, strong and squinting in the sun. I see anew my own failings in the stark light of day, just as I see how I was made to feel small and less-than when I am not small and I am not less-than. I am suddenly surrounded by people who are giving to me selflessly — by listening, by remembering, by offering their own stories as gifts. I am full of new knowledge and its necessary consequences: I am more wary of promises. I will pay more attention to my own doubts. I am not, and will never be, as innocent as I was. I now know how to be kinder to people whose hearts hurt. I am also spending time with Wisdom. She is harsh, but she is honest. My new house is full of windows. Light pours in every morning. I wash the dishes and I fold the laundry and I give away boxes of things that no longer serve me. I read books and I talk to toddlers on the phone. I am okay and not okay in the exact same moments. I am in the air and I am firmly on the ground. I know it’s so cliche, but everything does happen for a reason. You will now not have to divide your attention from your sister. I will say a prayer for you. I’m so sorry to hear this. I have been in a similar situation and I’m sorry to know as kind of a person as I’ve known you to be is going through such a rough time. So eloquent and beautiful, your words spill onto the page to reveal honesty and rawness. I sense a strong and resilient spirit. Lots of love. Oh, I understand the rathers and the added pain of not speaking. You have so much heart, and I thank you for giving voice to what many of us feel but cannot articulate. I wish you peace and send you love. I was replaced in my darkest hour. Two infants, fighting cancer…stuck. You are young, beautiful, smart..your future is unwritten. Take time to heal, but know wonderful things are waiting for you. You just have to be open to them. Maybe someday this will be true for me, as well. Much love to you. Thank you, Christina, for sharing, once again, the raw and true pain of what many of us can only begin to imagine. My heart aches for you and hopes that sharing your beautifully written thoughts and feelings brings healing and peace for you and your family as you journey through this difficult and uncharted territory. 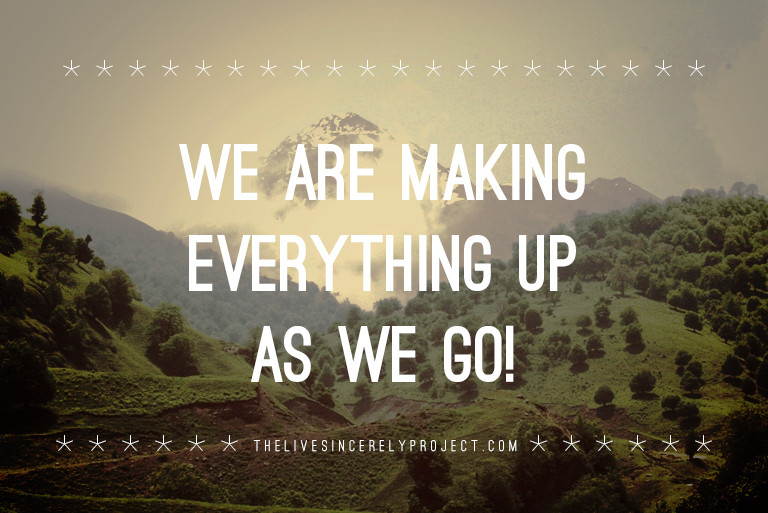 So true: “Everyone is making everything up as they go” … and we are all transformed by the unimaginable experiences we somehow endure, and eventually conquer. Thank you (and Jessica) for the example of your unblinking courage through the gift of this blog. Love and Hugs from Colorado! What touching words for such dark times. You have made an ugly experience more beautiful by sharing it honestly & without viciousness. Much love to you, C! You know I’m holding you in the heart of my heart on this. I have been calling on that strength since my son Patrick died seven years ago. And I know I am happier when I can speak of him, of my journey as a bereaved mother. Happier than when I keep my mouth shut, fearing to ‘bring people down,’ fearing someone will say, as someone did, that I am ‘stuck in grief.’ I am in grief, yes, but not stuck. I have ‘gotten on with my life,’ and I laugh a great deal and rejoice in being alive, but I learned to honor my loss by speaking of it, whenever I’ve felt the need. Honoring our losses by telling our stories is the way we keep them from overwhelming us, I think. Zann, I’ve certainly found I’m hesitant to talk because I don’t want to seem like a downer, or bitter, or stuck — but my silence was accumulating into an unnamed and undefinable knot in my stomach. I didn’t even realize until I was writing this how much telling some of the story could help with that. Thank you for all the wisdom you continue to share with me. Christina, you are a gift to me. You remind me of truths. Thank you, and know that I am “out here” caring about you, your sisters and your courage. I LOVE that your house is a house of light. The very best thing for what ails me, too. I’m so glad I had a daughter who went off to college and found her own heart beating in others, like yours. SO SO well written. You were not vindictive nor bitter and this piece was beautiful. Sad yes but we have all been there, some to a lesser or greater extent but to use it as fuel to make something beautiful, you inspire. It’s how so many songs, pieces adorned, and incredible things have been made. Thank you. p.s. this movie has been on my mind and your post is strangely apropos, the trailer is beautiful enough. http://youtu.be/NTAzcTZTY1g Peace. I looked up to your blazing confidence and ability to always be yourself in high school. I’m proud to see that no matter what lemons you’ve been given, you have embraced them. I had my son 8 months ago, and I’m reminded every minute of how drastically things can change in a short time. I’m happy to report that I still look up to you now, almost 13 years later. How I wish I could write like you. I had to smile at the word “replaced” because there is only one you and you can’t make others see how wonderful you are. I lost my 28 year old friend and husband during the same time last year. I remember watching my friend die of BC and wonder how he couldn’t see, we didn’t have it so bad. We were healthy and have two beautiful girls. Together for 13 years married, for three. How could he not see!??? But he couldn’t not see past his own wants. As you know you can not make a person be with you or stay and raise the kids if that is not what truly makes them happy. All this pain and all these gifts seem to balance out. Sending my Love and good wishes from Carlsbad,Ca.